In a world where politics, environmental tragedy and human welfare is seemingly in chaos, we often sit and watch from the sidelines feeling helpless to make a difference. But is there a way that we as individuals can do something, anything, to stem the tide of negativity and even, perhaps, cast a light of optimism and positive change in a world desperately in need of some love? I believe there is. I believe in kindness. These two words changed my life. They were muttered to me from a man I had just met; his name was Mark. Mark was sat in a wheelchair in front of me, the unfortunate victim of a tick bite that had stolen him of all of his physical ability. The doctors called it Lymes Disease; a disease that very quickly changed Mark’s life from one of an able-bodied man into one of a quadriplegic, unable to move, talk or breathe unassisted. Although physically handicapped, a bright light of ambition still burnt in Mark’s mind. Having seen me speak on Australian TV about goals, dreams and human ambition, Mark had reached out to ask me a simple question. A question that would profoundly affect the way we both viewed the world. You see Mark’s biggest dream was to complete a half marathon. His caregiver explained this to me in person on the day that we all met. As I looked down at Mark in his wheelchair, inspired by his resilience and aspiration, I was slowly overcome with an innate desire to help, I just wasn’t sure how. “What can I do?” I asked inquisitively, knowing only that I was willing to do anything within my power. Just like that, Mark’s bravery, vulnerability and openness had created an opportunity for the world to be slightly better. Let me correct that; he had created the opportunity for me to be slightly better. 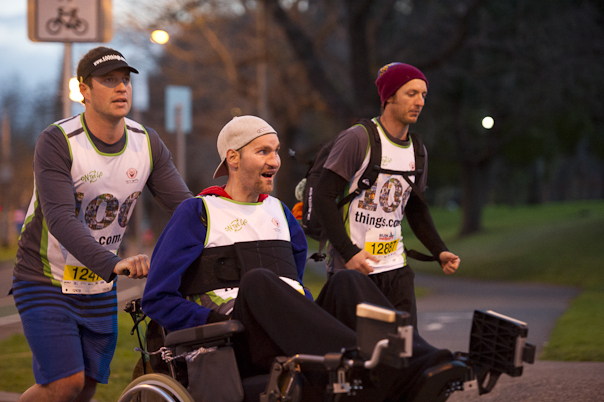 A few months later, Mark and I crossed the finish line of the Melbourne half marathon. I’d managed to push him with a small team of friends. It was the best thing that either of us had ever experienced. The tears, cheers and feelings of complete clarity tease me as I write this and I can’t help but wonder why. Why is it that we were so profoundly affected by this experience? Mark, inspired from that moment, has continued on with his list of dreams and consistently shows us that anything is possible. I, equally inspired, now travel the world helping as many people as I can via my website www.kindsum.com. Was it the physical pursuit, the tangible finish line or the unlikeliness of the goal itself that continues to drive us in our chosen directions? Perhaps in part, yes, but upon further reflection I think it comes down to one word; connection. To be human is to connect. Connection is two sided; it wasn’t that I helped Mark, rather Mark helped me help him. By this, we both contributed to an experience that bonded us and because of that, the world as Mark and I see it is a slightly better place. Imagine if we all found opportunities to help someone. Not just one or two people, but millions of people around the world. The incoming tide of positivity, progress and connection would be immeasurable and I’d argue that the world would indeed become a better place for everyone. How does this happen? We need to learn how to connect again. Putting your hand up and asking for help is a daunting but important first step towards true human connection; it’s all about creating the opportunity. Without this, we all stand side by side in silence, unable to affect any change because we don’t know how. But with the bravery and vulnerability of asking comes the opportunity to answer the call. This is the second step to connection; response. Thankfully what I’ve learnt thanks to Mark is that this is the easy part. We all have the innate ability and desire to help, we just need the opportunity. So in response to a world which highlights many negatives on a macroscale, is there a way that we as individuals can make a difference? The answer is a very simple YES. All we have to do is connect with the person next to us. It will change not just your life, but the lives of everyone you touch. And if you believe that real change starts at a grassroots level, you’ll also see that this change can start right now. If you need help in moving forward, be vulnerable, be brave, RAISE YOUR HAND. Share your story at www.kindsum.com or nominate someone now.